A cool new tool for web designers who love those fancy, web 2.0 stripes and textures. 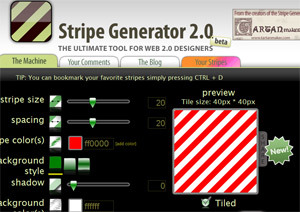 With the Stripe Generator you can create stripe like textures with stripes of various sizes, styles and colors. After you’re done designing your stripes, you can save and download them as a .png image. Also on the same website you can find the link to a Tartan creator for those lovely tartan textures.